To retain our reputation in the market, we are engaged in offering a qualitative collection of Wet Mix Paver. The wet mix paver is manufactured using optimum quality material and latest technology. In order to assure the quality of the wet mix paver, our quality experts check on numerous parameters. Along with that, we offer this wet mix paver in various specifications, in order to meet varied needs of our customers. For our prestigious clients, we are offering a commendable range of Asphalt Paver Finisher. 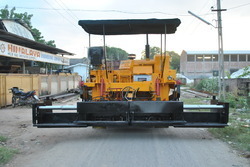 This paver finisher is provided with kerosene tank for the heating screed. We offer this paver finisher in diverse finishes and stipulations, in compliance with details specified by customers. The offered paver finisher is manufactured in accordance with market standards using optimum quality material and modern technology. Also, we offer this paver finisher our valuable customers at competitive prices. Looking for Wet Mix Paver ?